This is a repost from a report I did for The Fawcett Ave Conscripts that I wanted to put on this blog to bookend with my upcoming 'Republic to Empire' first-play report. 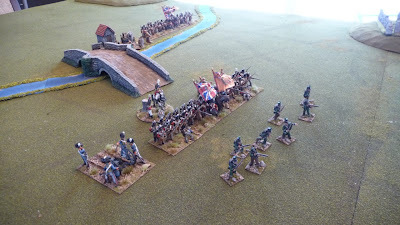 This past November Dan, John and Sylvain came over to my place to try out a small Napoleonic scenario using my unblooded copy of the 'Black Powder' rules. The scenario I came up with is a fusion of Clarence Harrison's starter scenario and a series of historical rearguard actions that the British conducted during their retreat to Corunna in January of 1809. During the retreat it was not uncommon for the British to attempt to forestall the French by fighting a delaying action at a river crossing, fall back and then demo the bridge. Accordingly, the scenario has a small British force trying to buy time for the engineers to rig the bridge to blow while a large force of French press on in an attempt to push the rearguard aside, force the bridge crossing before it is destroyed and carry on to threaten the main British force up the road. In this action the British have two infantry battalions as their mainstay. One is the solid 28th which historically fought in many of these rearguard engagements. They are solid regulars. The other is a composite battalion made up of bits and scraps of several battalions that have largely disintegrated during the retreat. I classed them as 'Untested' which means that once they take their first casualty they test to see how they react for the rest of the battle. This can range from near-collapse to raising-up to fight like heroes. 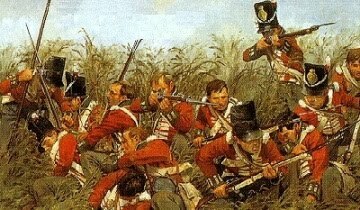 The British line infantry is also aided by two companies from the 95th Rifles. These specialized skirmishers can either fight on their own or be attached to any battalions to reinforce their own light companies. The British infantry is also supported by two sections (4 guns - basically a half battery) of Royal Horse Artillery, one section of 6-pound canons and the other of 5.5 inch howitzers. The French vanguard has a full brigade of infantry composed of four line battalions (roughly 2400 men). One battalion is considered large in size and all are classed as Regulars. In addition the French force benefits from being supported by two squadrons of Dragoons (around 160 troopers). The French commander, a General of Division, knows that the Emperor wants the British 'brought to ground' so I've rated him as a bit of a fire-eater to help keep the French moving forward aggressively. We rolled for sides with John taking the British while Sylvain and Dan having joint command of the French. Though this scenario could easily be played on a 4x6, or smaller, we played down the length of a 5x8 table with the bridge about 2 feet away from one end. The British (John) set-up first with one battalion, the 28th, a bit forward of the bridge with a 6 pound section of guns from the Royal Horse Artillery in support. The 28th also benefited by having the both companies of 95th Rifles in skirmish order to their front. John chose to make the 95th as in integral part of the battalion so they would benefit from the rules of 'mixed order' but risk the same fate if things went bad. The RHA howitzer section was deployed behind the river on the British right flank. The remaining British composite battalion was also back behind the river, arrayed in line next to the bridge. The 28th positioned in front of the bridge with the 95th Rifles acting as skirmish screen and a section of 6pdrs as artillery support. The French deployed 12" in from the opposing narrow edge. They chose to place the majority of their battalions in attack columns so they would benefit in the better command roll modifier (the rationale being that the compressed nature of an attack column makes it easier to manage as opposed to the more fragile and disjointed battleline formation). I believe the Dragoons also started in column as well to facilitate greater mobility. The base mechanics for Black Powder are reminiscent of Warmaster but perhaps a little more streamlined and sophisticated. Basically each unit only gets one chance with a command roll but if the roll is especially good (i.e. low) they can benefit with up to 3 actions (moving, formation change, charging). Alternatively if the roll is pooched then that unit does nothing and the commander is done for the turn. This mechanic makes the command phase entertaining as there is much arguing of who should 'lead off', general nail biting, groans and cheers. It also makes movement and charging interesting as a lucky unit can potentially take the bit by the teeth and streak across the table to engage the enemy while other poor souls can have an unlucky streak and flounder. 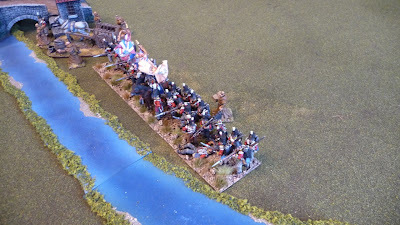 The French roll forward to attempt to push back the lead British battalion and gain access to the bridge. The French moved first and decided to keep their formation as tight as possible for maximum impact. The British opened up with long range artillery fire causing a bit of disruption in the French ranks but nothing that a few bawling sergeants couldn't handle. The rifles tried a shot at the cavalry but were just short of their maximum range. The Dragoons arched their collective eyebrows at the rifles' longer range and knew they had to get these fellows sorted quickly. In the next turn the French managed their initial moves but did not get the rolls to allow them to charge home. John 'held his bottle' a bit longer to give the approaching cavalry and march columns some more galling fire, all the while risking the coming charge. Next turn, the French used their initiative moves to declare a series of charges from both the infantry and cavalry. The fact that the cavalry were threatening caused the British battalion to automatically recall the Rifle skirmish screen and attempt to form square. The Brits made their roll and formed a solid square to repulse the cavalry. BUT the wily French, knowing the English were vulnerable in this compressed formation have also sent in their infantry to take advantage of the situation. The Brits gave a good account of themselves but were forced to fall back from the combined arms threat. But here was the rub: The bridge hampered their retrograde movement in square and with nowhere else to go the men panicked. The 28th's square broke and its men were swept aside by the French assault columns (the Rifles sharing their fate). The now isolated British horse artillery section fired canister at short range and scampered back to redeploy at the river's edge. The remaining British battalion gaped at the slaughter in front of it while its commander screamed ineffectively at his men to move to the bridge to thwart the French. The Brits needed to hold for three more turns to have the bridge ready to be blown. In his turn, John rolled for a 'follow me' order and moved his command stand to join the British battalion (they used three actions to change formation, move to the bridge and shake-out into line). The howitzer section had a perfect target with the French battalion that had just silenced their brother unit. They fired canister which caused the battalion to fall back in disorder, out of the action. Two turns left. Dan rolled for the French Brigadier and he led the leading column across the bridge to assault the British on the other side. The Brits fired a closing volley and prepared for the assault. As the French were on a very narrow frontage in order to cross the bridge they could only bring a limited amount of men to the fight whereas the British were arrayed in full battle order. The result was that the French battalion was shattered on the British line. Nonetheless they did cause enough casualties for the British to have to test their mettle as they were a composite battalion. If John rolled poorly they could route leaving the bridge entirely undefended. John's luck held and so did the British. John then redeployed the howitzers to enable them to give enfilading fire on a French column marching to the bridge. In a spectacular roll the artillery tore the guts out of the French formation making it combat ineffective. The French were running out of troops and they had only one turn left before the British could see if they could demo the bridge. 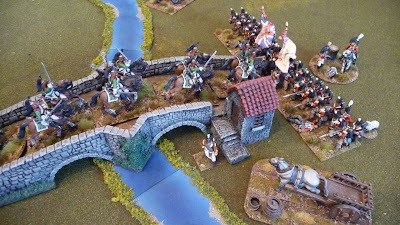 The 1st Neuchatel assault the bridge while the British prepare to give close range volley fire. 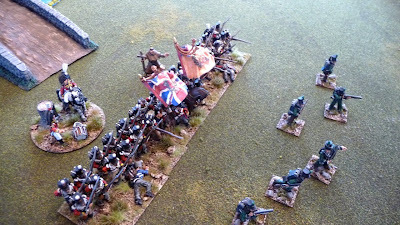 Sylvain suggested trying to soften the British up with musketry but Dan was chomping at the bit wanting to force the issue with the bayonet (watching the two 'debating' was as entertaining as the game itself). Dan won out and another French battalion was sent in, but alas it too was sent back reeling from the steady British volley fire. In his turn, John had the British stay put, give harassing fire and basically waited for the turn to end. The engineers completed their preparations and John rolled to see if the bridge would go up. The roll was too high so he girded himself to hold for at least another turn to try again (at this point we speculated that during the assault some French rear-rank fusilier had dropped his trousers while on the bridge and put out the fuse). Things were getting desperate for the French. 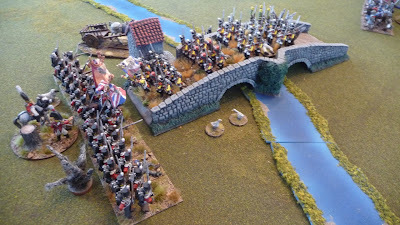 Dan and Sylvain decided to move the commander to the two squadrons of Dragoons to entice them with medals and easy women and then led them in a pell mell charge across the bridge to see if the British would fail in forming square. They did not. The square was formed and the cavalry were compelled to recoil. John rolled the dice for the bridge and was relieved to see it finally blast apart ending the French pursuit for that day. We had a load of fun with the game with the result going right down to the last turn. The rule's mechanics were very easy to pick-up with us basically using the single quick-reference playsheet after only a few turns. Later I noticed I made a few slips here and there but I attribute that to the natural learning curve on any new ruleset and it did nothing to hamper the enjoyment of the game. I think they would be great for a large group of players as the command rules are quite streamlined promoting quick resolution of turns. On our part I think I can safely say that we'll be giving them another try. In a couple weeks we'll give "Republic to Empire" a run through using the same scenario. We'll let you know our thoughts.